Today we are publishing the tenth chapter in our new free serialised E-book ‘The Future of the Middle East’, a co-production by Global Policy and Arab Digest edited by Hugh Miles and Alastair Newton. Freely available chapters are available here and will be collected into a final downloadable publication in the spring. Anthony has spent most of his career in the Gulf. He is currently based in Dubai where he manages a Lloyd’s-based reinsurance brokerage, RFIB whose regional office he set up. Prior to his move to Dubai, he served in the British Foreign Office, where he had eight jobs connected with the Arab World, culminating in his appointment in 1994 as Ambassador to the UAE. On leaving the Diplomatic Service, he joined Robert Fleming, in their Middle East Corporate Finance Department. When Flemings were taken over in 2000, he left to set up a consultancy business in Dubai, and continues to advise various companies operating in the Gulf, especially in Saudi Arabia and the UAE. During his time as a diplomat, he was variously involved in UK-GCC defence relations, the technical security of Missions abroad, the management of the BBC World Service and the UK’s commercial efforts in the Gulf, particularly in the oil and gas sector. He is a keen observer of the Gulf scene and travels regularly in the region. Prediction is very difficult, especially if it’s about the future. When Niels Bohr, the famous physicist, wrote this he was not of course thinking of the Middle East, but it is good advice there too. No one saw the “Arab spring” coming, despite all the world’s think tanks and intelligence services. Since 2011 the governments of Syria, Libya and Yemen have collapsed. Iraq is similarly a failed state, having had its dictatorship removed by the US-led alliance in 2003. Sudan is a mess and South Sudan has descended into civil war. Peripheral states like Afghanistan and Somalia have very weak central governments, and spread violence into other states. In the core ME region, countries like Egypt and Saudi Arabia are trying to implement far-reaching economic reforms, which risk provoking social unrest. In none of these countries is a solution to the unrest likely to be quick and in the failed states, wars could continue until 2020 and beyond. The West, particularly Europe, which is suffering from waves of refugees and economic migrants from the wider Middle East and Africa, has to decide how to deal with the multitude of problems that constitute the ME region. Direct intervention is a largely discredited policy. The US was convinced, following 9/11, that if governments that they considered hostile, corrupt and fossilized were removed, then the people of these countries would be liberated and would welcome the imposition of western systems. This sunlit upland would lead to participation by all in the governing process, to economic development and to beneficial side-effects like the protection of minorities. The signal collapse of that policy in Iraq, and President Obama’s determination to pull America back from involvement in any further costly wars aimed at nation building in the ME, has meant that the West is now looking for new ways to address the question: what to do about the Middle East, which is widely in a state of collapse, riven by wars and facing economic disaster? We must peer into the fog and try to lay down some guiding principles. The omens for a renaissance in the region are very poor. I began by reading the Arab Human Development Report 2016, a study, the first since 2011, and the sixth in the series, which is prepared by Arab academics for the UN. It is a respected source of statistics and analyses of the Arab world, in this case concentrating on the problems faced by Arab youth. The Arab world is the only geographical region that is regressing steadily in terms of the UN’s human development index, which measures elements like longevity, health, education, corruption levels and the standard of living. It seems, according to the index, that the region is soon to be overtaken in broad economic terms by Sub-Saharan Africa. The report calculates that to absorb the number of work-force entrants and stabilize youth unemployment, the region needs to create over 60m new jobs by 2020. The Arab region is home to 5% of the world’s population, but in 2014, it created 57.5% of the world’s refugees (including the Palestinian refugees), 68.5% of the world’s battle-related deaths and 45% of global terrorist attacks. Giving the young men and women of the Arab world a decent future in these conditions is spectacularly hard. The report points out that young Arab people, by which they mean those between 15 and 29, and who number about 105m, or one third of the total population, are better educated, more active and aware of what is going on in the world than ever before. Governments however, instead of regarding youth as a resource in which to invest for the future, have generally employed repression as a way of keeping young people in check, without addressing the root causes of their demands. No way has been found, in the core Arab countries that are now experiencing such massive instability, to draw young people into any kind of political process, so as to create a measure of trust and cooperation between the ruling classes and the people. This is a key element in building solid institutions in Arab countries that can outlast political change. States that depend on one man and a political clique around him, are unlikely to survive a sudden change of leadership. The report demonstrates that the economic model being followed by most Arab states is not working: job opportunities are shrinking across the region, and many countries are badly affected by poverty, made worse in many countries by the fall in the price of oil, poor health and education services and widespread corruption. Over 60% of the Arab world is under 30 years of age. However, the rate of participation of Arab youth in the workforce is the lowest in the world, particularly among women, and the rate of youth unemployment is the highest in the world. The Gulf Cooperation Council (GCC) states are doing better, blessed as most of them are by smaller populations and high oil incomes, even after the sharp price fall since 2014. Their stability is based on accepted institutions, especially their monarchies, growing prosperity, and better education and health services than elsewhere in the region. It is true that most of them have large foreign workforces, mainly from South Asia, which in some cases outnumber the native populations, but by allowing them to make remittances to their home countries, and by generally improving their working conditions, Gulf governments have avoided instability or serious unrest. In short, if we have Iraq, Syria and Yemen at one end of the spectrum, the United Arab Emirates (UAE) and some if its GCC colleagues are perhaps at the other end, representing what most other Arab states would like to become. Twenty years ago, observers of the Arab world, like Gary Sick, were predicting that the pressures exerted on the Arab states by the rising tide of youth would force governments to liberalise their economies and give their peoples a say in the way they were governed. Sick described what he saw as a slow motion revolution in the Arab world. Many therefore saw the Arab Spring six years ago as evidence that the revolution had in fact speeded up and concluded that governments would be forced to adapt to the demands of the middle-classes and modern-minded youth and to reform. It was not initially apparent that the pressures would explode into widespread extremism, violence, the collapse of institutions and states, and mass migrations of peoples, though Iraq was there as a case study. Tunisia, the birthplace of the Arab Spring, and of Mohammed Bouazizi, whose suicide unwittingly launched this traumatic process, perhaps gives us faint hope that evolutionary change can be made by rational people. When I was a young Diplomatic Service officer fifty years ago, we regarded the Arab world as a region of hope and great possibilities. Saudi Arabia I was told, was economically about as prosperous in per capita terms as South Korea, which was emerging from the effects of the Korean War. We clearly expected the Kingdom, with its vast oil reserves, to grow faster than the impoverished South Korea. (The latter’s per capita GDP is currently around 20% higher than that of Saudi Arabia.) Iraq I learned, was one of only two countries in the world that had everything to enable them` to be prosperous and self-sufficient: mineral resources, water, good productive land, and trained people. (The other was Argentina.) I was able to drive freely and alone around most of the Arab countries in my short-wheel base Land Rover. Arabia and North Africa were in general peaceful, content and optimistic. I learned about Arab nationalism, and the fact that though all Arab countries comprised different tribes and races, they were all part of Al Umma Al Arabiya, the Arab Nation, which as a united force would be unstoppable. Let us look more closely at what has changed a group of countries which were stable and full of promise fifty years ago into the most chaotic region on earth. The Arab region was divided into nation states a hundred years ago following the First World War. These states were established largely as a result of western colonial interests and borders were drawn that reflected western ambitions or convenience rather than the interests of the Arab peoples. (The Gulf States were fortunate in that their borders have mainly followed natural boundaries between tribes and peoples.) 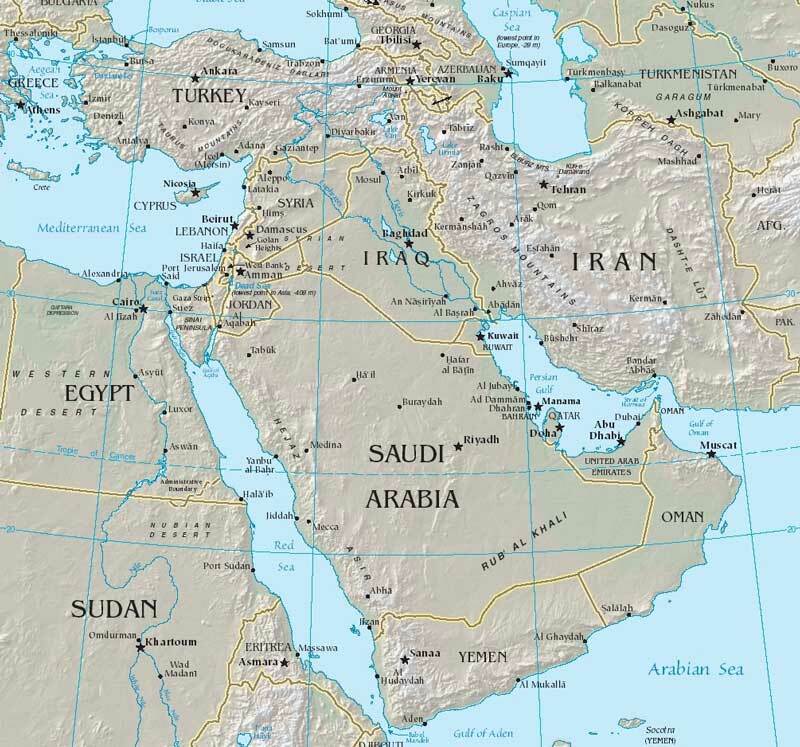 The chaos in the Arab heartland is calling some of these borders into question, but I believe that if Arab governments in Baghdad and Damascus are able to reassert control over most of their territories, they will try to re-establish the borders that they have recognized for the past hundred years. All states find it hard to re-define borders, even in favorable circumstances. The key area of interest will be Kurdish territories, in the light of their historic desire to secure more independence from the Iraqis, Syrians and the Turks, and the leading role the Kurds have played in promoting political change in these countries. Some borders and nations will inevitably change. However Arabs do not in general see themselves as part of nation states, particularly if the state fails to deliver basic needs and suppresses all opposition. Egypt is the principal exception to this rule, though Egyptians will often claim to be different from the Arabs. In many Arabs states, if the central government cracks or disappears, society rapidly breaks down into family and tribal groups, which form militias, and into religious sects. Me and my brother against my cousin, I was told; me and my cousin against the world. State institutions, including parliaments, are distrusted or, in the case of most Interior Ministries, feared. States which were never real states, like Libya, Iraq or Syria, break down into their smallest parts which start fighting among themselves. Added to this explosive mix is religious hatred, which Arab leaders like Gamal Abdul-Nasser, the Assads, and Saddam Hussein understood well and successfully repressed for many years. It was western naivety and conceit that led George W Bush to believe that removing Saddam Hussein in Iraq would set a good example, leading to the adoption of western political systems and herald a new era of sweetness and light. Hardline Sunni movements had been waiting for their chance. IS, which grew out of Sunni militants operating in Northern Iraq and across the border in north-eastern Syria, took Fallujah and Ramadi in the early months of 2014, and captured Mosul in June of that year. The world suddenly took notice of the way that 1500 insurgents drove 30,000 Iraqi troops out of the city and captured huge quantities of mainly US military equipment. For the first time in modern history, a major insurgency in the Arab world led to the occupation of large areas of Iraq and Syria, and forced around 6m people to live under IS control. The Islamic State was born. Its days may now be numbered: the battle to recapture Mosul in now under way and the city will most likely be liberated before the third anniversary of its capture. That may not be the end of IS altogether. They have been looking for somewhere else to use as a base, so that the Caliphate will not be extinguished. IS tried to establish a base in Libya, and they have looked at other regions, like Mindanao Province in the Philippines and areas in Central Africa. The movement may resort to Al Qaeda-type tactics and promote terrorist attacks across the world, relying on “lone wolves” rather than any central organization (the recent attack near the Houses of Parliament in London is but the latest example). The West has been trying to lower its profile in the final struggle against IS in Syria and Iraq, and for example let Iraqi Government forces play the leading role. However there are constant arguments over how best to deploy Shia militias in the liberation of Sunni Mosul, and I note that it has now been admitted that US and British Special Forces are involved in the battle for the city. President Trump claims to be against US involvement in wars like this in the Middle East, though he seems to be susceptible to the argument that IS (or ISIS as the Americans call it) may remain a threat to the west for many years to come, if not extinguished as quickly as possible. Iraqi friends tell me that they fear what will happen once Mosul is recaptured, since there is a danger of a vacuum being created which extremists could fill once again, as happened twice before in Fallujah. This is a serious risk, if the Shia-dominated Iraqi government fails to govern the Sunni regions fairly and bring them stability and prosperity. Some would like the Americans to stay to guarantee stability, but that now seems highly unlikely, and is, I would argue, undesirable. There has been an interesting debate over the real origins of IS. They claim to be the successors of the Caliphate, and trace their origins back to the time of The Prophet, and their message to the Quran and the Hadith, which they are extremely adept at quoting. Some Arab countries, like Saudi Arabia, as I know from attempts by the EU to engage the Saudis in a dialogue about Islamic extremism, point out that IS is not Islamic: Islam is a religion of peace – IS cannot by definition be Islamic, and the problems that are caused are therefore not Islamic problems. I would add that IS’s obvious skill in deploying Islamic justifications for their actions and quoting illustrations from Islamic history, make it harder for scholars in other Arab countries to contradict them. I have just read an interesting study of modern Jihadist and Salafist beliefs, The Way of The Strangers: Encounters with the Islamic State, by an American journalist Graeme Woods who spent two years interviewing jihadi fighters who have been in Syria and Iraq, or who are supporting the jihadist cause in the Middle East and in other countries like the US, Britain, Australia and the Philippines. Wood leaves the reader in no doubt that IS is regarded by all its adherents as a deeply religious movement, which will continue, even if the Caliph, Abu Bakr Al Baghdadi, is killed. Francis Fukuyama, the celebrated American philosopher, believes, as he explains in his recent book Political Order and Political Decay, that IS is a product of identity politics rather than outright religiosity, and he believes that IS will not last long. He attributes its rapid rise to the weakness of Arab Governments in the region, rather than because it has an inherently strong political model of its own. He may be right about IS’s origins and its longevity, but I believe that he has underestimated the fires that the religious wars have started, setting Sunnis against each other and against the other regional sects, such as Shia, Zaidis, Alawites and Druze, not to mention the Christians, which I expect to burn for many years to come. What then can the West do? In the central Arab world, we have a large region where development has gone backwards, where the youth are in many cases not engaged, educated or motivated, and where the absence of solid institutions has meant the collapse of half a dozen states, which can only be resurrected with foreign help variously from the Europeans, Americans, Russians, Turks and Iranians. Yet history shows that foreign interference can have dire effects. Hussein bin Ali, the Sherif of Mecca told Lawrence of Arabia in 1916 that foreign meddling in the Arab World would have tragic consequences. (Hussein, by the way, proclaimed himself Caliph after the collapse of the Ottoman Empire in 1918, but was unable to maintain his authority for long. The Saudis ended the Caliphate when they conquered the Holy Places in 1925.) The invasion of Iraq by the US and their allies in 2003 led to one of the longest and most catastrophic wars in US history, so the west would be well advised to make it a central plank of their policy to stay out, at least militarily, and to concentrate on defending themselves from jihadist terrorist attacks at home, which are likely to continue for some years to come. Yet huge military machines tend to get used, sooner or later. Presidents who stop and think, as Obama did in Syria, get pilloried for weakness. Furthermore western governments should try to avoid being identified with any particular Arab governments or movements, and deal with each of them with as few preconceptions as possible. If that means doing business with strongmen, as we were once happy to do out of a desire for a quiet life and stability, we should be prepared to do so again. We should avoid giving the impression that we prefer any particular stripe of regime: non-interference means just that. To Arab politicians who say that the west should favour Islamic governments, since that is what most Arabs want, I would argue that this may not in fact be the case, and that Islamic parties have no monopoly on competence or stability, as we saw with the Muslim Brotherhood in Egypt. We should support measures that make the Arab world more competitive and economically sturdy. We must help Arab states deal with the vast range of problems listed in the Arab Human Development Report. The Brotherhood for their part have so far failed to demonstrate that there is an Islamic solution to an economic crisis, youth unemployment or a food shortage. Once IS has been defeated in Iraq and Syria, the west should leave it to the Arab countries to deal with religious wars themselves. The west can discreetly assist with intelligence and training. The US and Europe should provide help in building institutions in the region, through education and technical assistance. The Americans may find it hard to bear if Russia takes a prominent role, in cooperation with the Turks and Iranians, in trying to broker peace, for example in Syria. This is what happened in January this year, when these three regional powers held a conference on Syria in Astana, to which the Americans were invited as observers. However I would judge burden sharing and spreading the risks to be a better policy than one of direct intervention and nation building by force. By any rational analysis, the causes of the unrest in the Arab world are very deep, and we will have to live with the consequences for decades to come. Enunciating a new western policy of self-restraint will be very difficult, yet it is time to take a long look at the way ahead and avoid the urge to send in the Airborne Division.